Some types of evergreen garden plants are shrubs, other are trees. Evergreen trees, as stated in the name, provide green foliage all year round, as well as backbone structure for the whole of the garden plants. Even a small garden can benefit from some of the many variety of evergreen trees available in the UK. 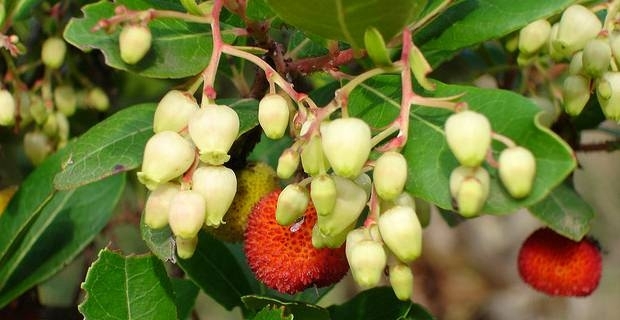 Accordingto the Royal Horticultural Society, amongst the best small evergreen trees for use as garden plants is Arbutus unedo, or Strawberry Tree. The Strawberry Tree of the family Ericaceae, is a small evergreen tree of bushy habits. It features dark green foliage all year round, with fruits and flowers in Autumn. The flower is small, bell shaped, either ivory or pink and the fruit is red and similar to a strawberry, hence the common denomination. It grows on well drained soil and prefers low to moderate moisture, direct sunlight a sheltered position, due to its late flowering. 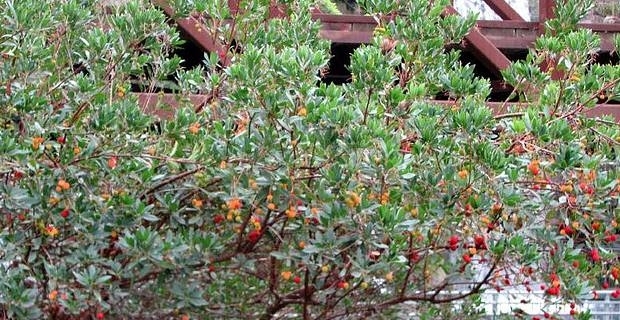 The Arbutus unedo propagates by seeds and semi hardwood cutting and reaches a maximum height of 4-8 metres in 20-50 years. Widespread in the mediterranean region, this elegant tree is cultivated as ornamental, but has many other properties. Its flowers are used by bees and their honey production and its red fruit not only are food for the bird but can also be made into jams or, tipically, into the Portuguese medrhono brandy. Furthermore, this plant has traditionally been used in folkmedicine as antiseptic, against rehumatism and for its astringent qualities. The Strawberry Tree's flowers and bears fruits in Autumn, but it does so alternatively, with the flowers one Autumn, and the fruits the following year. Because of this characteristic, it also provides a good climbing frame for clematis. It is also ideal for perimeter planting when allowed to grow into big, rounded bushes. Amongst many evergreen garden plants, this modestly sized, bushy tree, is easily available and grows on almost any soil, given direct sunlight and a little shelter from extreme cold. Bees will be particularly glad for its late, autumnal flowering and birds, the following Autumn, for its berries. Not to mentions climbing plants that could take advantage of its solid structure. As a whole, your garden and its inhabitants will benefit greatly from this generous new arrival, as much as you would from its ornamental qualities.